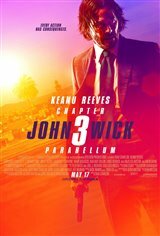 Super-assassin John Wick (Keanu Reeves) is targeted by hit men and women everywhere after a $14 bounty is placed on his head for killing another member of the international assassin's guild. It doesn't look like there's any hope for him… the High table and the entire city want him dead. However, John reconnects with Sofia (Halle Berry), a former friend and hitwoman. The two join forces to help John save his life and fight his way out of New York City.